CHICAGO, IL--(Marketwire - December 1, 2008) - ZONARE Booth #909, Lakeside Center, Hall D -- ZONARE Medical Systems, Inc., a developer of premium ultrasound systems, today introduced its new echocardiography release for the z.one ultra system here at the 94th Scientific Assembly and Annual Meeting of the Radiological Society of North America (RSNA), Nov. 30 - Dec. 5, 2008. The new release incorporates Zone Sonography™ technology, premium image quality, and improved performance and features for use in hospitals and bedside studies. "By bringing the premium performance echocardiography release to the z.one ultra system, we are expanding the value and versatility of our customers' investment in ZONARE," said Don Southard, president and CEO at ZONARE Medical Systems. "This release represents all the elements of a complete premium performance solution -- from premium image quality and advanced color and spectral Doppler sensitivity to new TEE capabilities and a comprehensive calculations package. As a result, we are offering our customers an echocardiography solution to help address the critical needs of busy clinical practices." Developed in close collaboration with ZONARE's customers, the new echocardiography release for the z.one ultra system builds upon advanced diagnostic imaging capabilities and workflow improvements to meet the demands of today's changing healthcare environment. With the z.one system, clinicians can perform a full diagnostic exam that is comparable to those done with large 300-400 pound ultrasound systems. With a comprehensive calculations package for left ventricle analysis and valvular pathologies, physicians can assess their cardiac patients' valvular and ventricular function efficiently, leading to confident diagnostic decisions. In addition, advanced color and spectral Doppler sensitivity help physicians to more accurately assess overall cardiac function. ZONARE's echocardiography release further enhances the ergonomic features offered on the z.one ultra system as well. There is a one-button image optimization along with continuous focusing, which reduces keystrokes needed to optimize the study. In addition, the new option offers transesophageal echocardiography (TEE) imaging capabilities for expanded clinical utility. Recently, ZONARE Medical Systems was ranked the no. 1 fastest growing company in the Silicon Valley and San Jose, Calif., area by the Silicon Valley Business Journal. About ZONARE Medical Systems, Inc.
ZONARE Medical Systems, Inc., based in Mountain View, Calif., develops, manufactures and commercializes premium ultrasound systems that combine its proprietary technology with an innovative physical design. 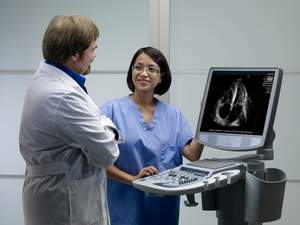 Zone Sonography technology, ZONARE's unique patented approach to ultrasound imaging, is focused on bringing premium image quality, performance and features to a wide range of clinical settings. Additional information can be found at www.zonare.com. Zone Sonography is a trademark of ZONARE Medical Systems.